Did you know oats are a natural powerhouse of goodness? ***Every day in the UK Quaker makes 16,000 breakfasts available for children at schools in the greatest need. Enjoy as part of a varied and balanced diet and healthy lifestyle. Oat beta glucan has been shown to lower blood cholesterol. High cholesterol is a risk factor in the development of coronary heart disease. Coronary heart disease has multiple risk factors and altering one of these risk factors may or may not have a beneficial effect. For over 140 years, the Quaker Oats family has been inspired to produce delicious, nourishing breakfasts. Quaker Rolled Oats are our oats in their purest form. Cut, kilned and rolled to the same thickness, and with no artificial colours, flavours or preservatives; our wholegrain oats maintain the delicious taste you would only expect from Quaker. Our porridge sachets come in a variety of natural flavours and are ready to eat in 2 minutes. 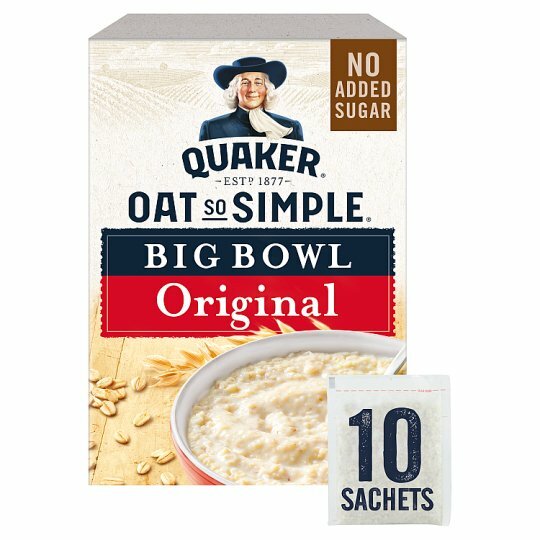 At Quaker, we are passionate about the simple oat. There is a huge range of Quaker Oats products available, so you are sure to find the perfect breakfast to get your day off to a tasty start! If you are in a hurry why not try our Quaker Porridge To Go. Made with 100% wholegrain oats these breakfast squares contain the same amount of oats as a bowl of porridge! Oat beta-glucan 3.6g per 100g. Each serving (38.5g) contains 43% of the 3g of oat beta-glucan suggested per day. By Appointment to Her Majesty The Queen Suppliers of Quaker Food Products. Quaker Oats, Royal County of Berkshire. 1 Simply boil 245ml (one sachet) of milk in a saucepan. 2 Stir in contents of one sachet of oats. 3 Simmer for 2 1/2 mins, or until milk is absorbed, stirring occasionally. 1 Tear open the sachet along the tear line. 2 Pour the oats out into a microwaveable bowl. 3 Use the sachet to measure the milk - Fill to the milk line (245 ml). 4 Pour the sachet of milk into the bowl & mix. 5 Place the bowl in the microwave for 2 1/2 mins on full power (Cat E min 800w). 6 Ping! Stir & Enjoy. If possible, please state when and where the product was purchased. We shall be pleased to reimburse you for the product.